-There is a Nomadic market with merchandise, clothes and other beautiful products. This is a CASH ONLY market. -Our food line up consists of meat, vegetarian and halal food. So whatever your taste is, you'll be satisfied. -We have cigarettes for sale, these can be bought with cash and pin. -The afterparty is four minutes from the festival terrain. -Tokens can be bought both with cash and pin. The infamous tribe of Nomads Festival will join spirits for the fourth consecutive year. Once again, we will dance, drink and enjoy music for one special day and night. In the past, the oasis has proven to attract a very special kind of crowd. Eager to travel to places unknown, dedicated to enjoy life to the fullest and generous and kind to one another. 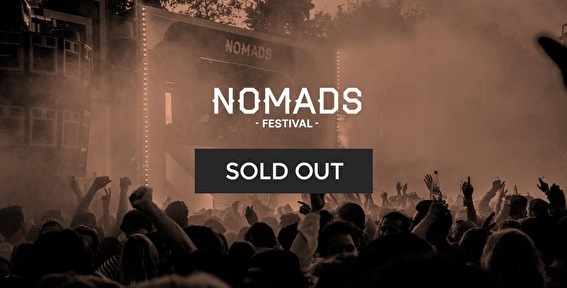 Nomads Festival has always revolved around it’s smiling tribe, and will never cease to do so. Together with the famous Kris Kross crew and the Lumberjacks In Hell family, we call upon you to follow us to our summer's gathering. Stroll around our market, taste exotic herbs and spices and just enjoy. Let’s meet at the oasis, we look forward to welcome you.